GW administrators announced earlier this month that they will not support fossil fuel divestment. Their decision comes more than a year after Fossil Free GW and other student groups began urging them to do so. Leaders of Fossil Free GW, a student-led campaign whose mission is to divest endowment from fossil fuel companies and educate the GW community about environmental and climate justice, stated in a March 3 press release that administrators plan to, “maintain investments in fossil fuels.” This decision comes despite a majority of students voting in favor of divestment in a campus-wide referendum last spring. Though the student organization launched their divestment education campaign in 2013, negotiations with administrators did not began until last February. The discussions came after the Student Association Senate passed a bill to put the question of divestment to a March 2015 referendum. After a record number of students went to the polls, the referendum passed with 71.1 percent of voters in favor of fossil fuel divestment. The university acknowledged the referendum and announced that a decision regarding divestment would be made in October. Fossil Free GW continued lobbying campus groups and attended numerous meetings with administrators including speaking with President Steven Knapp, Office of Sustainability Director Meghan Chapple and Deputy Vice President and Treasurer Antoinette McCorvey. But the fall semester came and went with no word from the university. By January, campaign organizers were getting impatient. With no answer from the university, the campaign decided to take a different approach: appeal directly to the Board of Trustees. Michael, along with leading Fossil Free GW coordinator and former Student Association Senator Frank Fritz, attended the February Board of Trustees meeting. It was there that they argued the moral and economic consequences of using coal and fossil fuels. Yet Michael and Fritz were disturbed to learn that most trustees had not heard of Fossil Free GW, the referendum or the overwhelming student support for divestment. “It was kind of a shocking disconnect. These are the people running the school, supposedly, but they had no idea about this huge issue on campus,” Michael said. Negotiations culminated in a Feb. 23 meeting, almost one year after the referendum passed, in which Chapple and McCorvey informed Michael and Fritz that the university would not pursue divestment. Fritz agreed and criticized the university for what he sees as a financial preoccupation. Meanwhile, administrators maintain that while fossil fuel divestment is not on the university’s agenda, other sustainable practices are being pursued. Following the administration’s announcement, Michael and Fritz remain doubtful of the decision. They also believe that the stance is not unanimous, especially among faculty within the university’s Office of Sustainability. “We’re not expecting anyone from the university to officially support divestment because of the administration’s say on it, but there are professors who support us,” Michael said. “We feel there may be a disconnect between the administration and what the faculty believe.” He declined to identify specific faculty members. Sustainability Student Coordinator, Ariel Kagan, declined to comment. 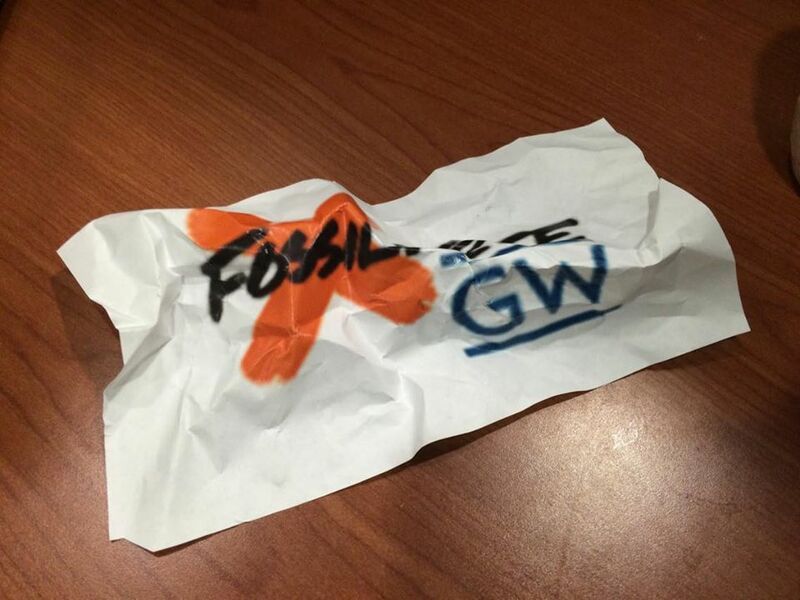 The university may have reached a conclusion, but Fossil Free GW is determined to reverse it. On April 6, the group will co-host a “Faith and the Environment” panel with GW Catholics, the GW Jewish Student Association and the GWU Muslim Students’ Association. It is intended to explore the moral implications of fossil fuel dependence. The advocacy group also plans to continue educating the university on divestment. However, some members of Fossil Free GW have suggested that the core issue might not even be fossil fuel. This entry was posted in Campus, Local, Student Organizations and tagged Divestment, Fossil Free GW, Frank Fritz, Sophie Ota, Student Association, Sustainability. Bookmark the permalink.